Note on Combo 2 & 3 reprint Edition: With both of these modules out of stock and the mounted map originally included in them now available in the main C&C: Ancients game (and separately), we have decided to combine the two modules into one boxed pack and remove the mounted board to get you guys as inexpensive a reprint edition as possible. 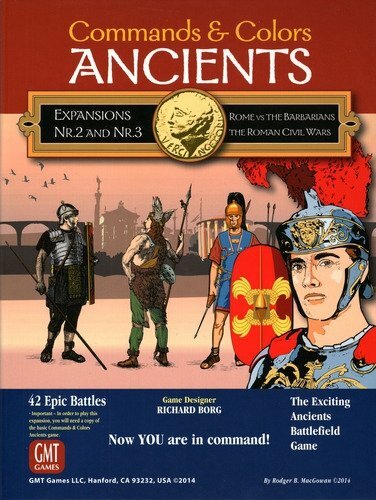 Imperial Rome and The Barbarians is the second expansion to Commands & Colors: Ancients. In this second expansion you will find historical battles that focus on Rome and the early Gallic invasion, invasion of the Northmen, the Servile War (Spartacus), Caesar's conquest of Gaul, the Roman Civil Wars and much more. Showcased in the second expansion, are over 20 scenarios that range from 390 BC (Allia River) to 9 AD (Teutoburger Wald), and all the blocks and labels you need to field the Roman and Barbarian forces to fight out these battles. By now, you know we can do this, because Commands & Colors: Ancients by design is a unique historical game system that allows players to effectively portray stylized Ancient battles that play to a conclusion in less than an hour. Imperial Rome and The Barbarians will feature at least one new unit type as well as several "specialty" units and leaders (Briton Chariots, Legionaries using the pilum, and Caesar, for example). Each of these operates within the confines of the original system rules, with only slight modifications to reflect their historical abilities and importance. 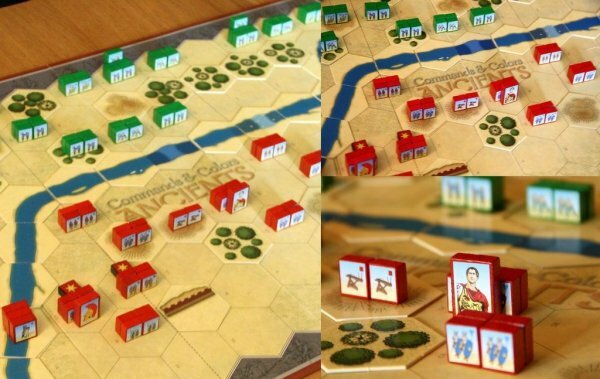 So, rules-wise, if you've played Commands & Colors: Ancients, you'll have no trouble at all learning the few special rules for these new types of units. The battle dice resolve combat quickly and the Command cards provide an element of luck that creates a fog of war and presents players with both challenges and opportunities for victory. Yet the tactics you need to execute conform remarkably well to the advantages and limitations inherent to the various Ancient units, their weapons, terrain and the history. 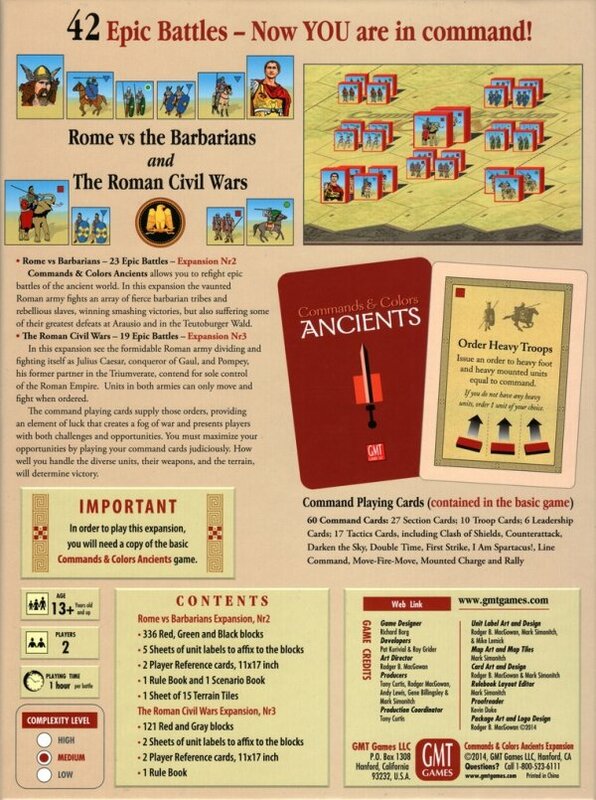 The Roman Civil Wars is the third expansion to Commands & Colors: Ancients. In this expansion you will find historical battles that focus not only on the most famous of the Civil Wars, but also the earlier First Civil War, and the Sertorian War in Spain where Quintus Sertorius, a gifted soldier-in-exile, defeated several larger Roman armies sent against him, until killed in 72 BC by assassins. Expansion #2: Rome and the Barbarians has been modified from its original configuration by the addition of a mounted battle board - an item requested by many of you - and a sheet of terrain tiles containing some new terrain types and some additional original tiles. To keep the P500 cost unchanged, the 110+ blocks needed for the Roman Civil War battles have been shifted to Expansion #3 set. 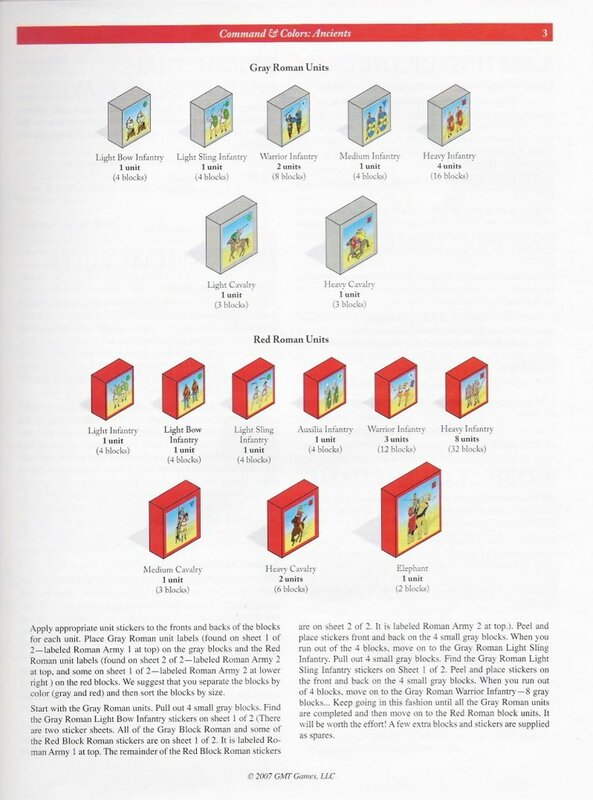 Expansion #3: The Roman Civil Wars will provide all the gray and red blocks and stickers needed to field two full opposing Roman armies when combined with the gray Republican Roman army from Commands & Colors: Ancients, and the red Marian Roman army from Expansion #2: Rome and the Barbarians. There will be at least 16 scenarios that range from 82 BC (Aesis River) to the Battle of Munda in 45 BC. 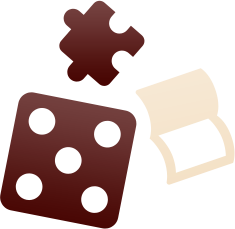 The Roman Civil Wars will feature familiar units with new capabilities. The Roman legions have evolved into the deadly fighting units of legend. In terms of Commands and Colors performance, the medium infantry units (representing less experienced legions) and heavy infantry units (representing the veteran legions) will now be able to move two hexes without engaging in close combat, or still move one hex and have close combat (as well as throwing their pilum - a capability acquired in Expansion #2: Rome and the Barbarians). You will be able to fight battles with medium and heavy infantry as you have never fought them before! 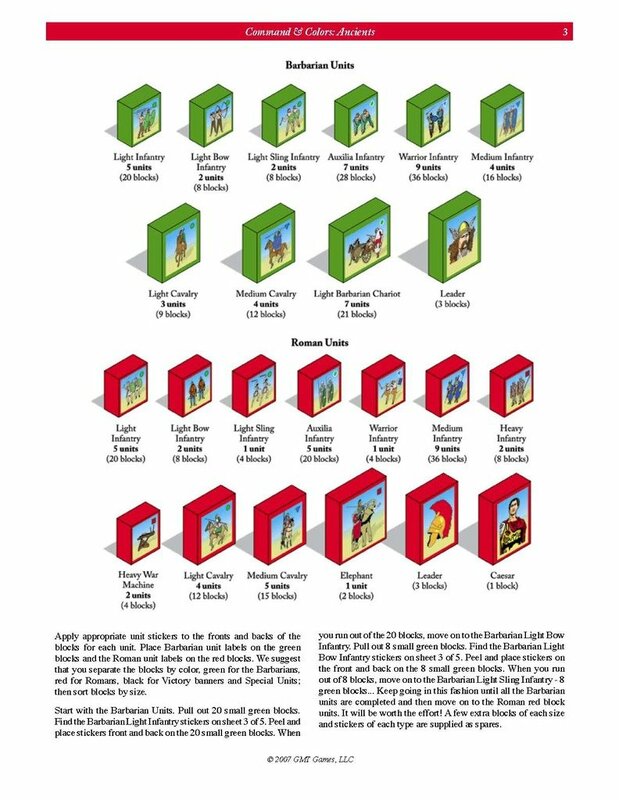 Rules-wise, if you've played Commands & Colors: Ancients, you'll have no trouble at all learning the few special rules for these legionary infantry units, for the basic mechanics remain unchanged. The battle dice resolve combat quickly and the Command cards provide an element of luck that creates a fog of war and presents players with both challenges and opportunities for victory. Yet the tactics you need to execute conform remarkably well to the advantages and limitations inherent to the various Ancient units, their weapons, terrain and the history. But that's not all... GMT is also going to include another mounted mapboard in Expansion #3, configured to be mated to the mounted board from Expansion #2. In addition the Commands & Colors: Epic Ancients new Command rules for fighting large-scale historical battles will provide those of you interested in fighting truly large-scale, multi-player, ancient battles the perfect and unique opportunity to do so with a number of your friends. Uwaga: to nie jest samodzielna gra. Do rozgrywki wymagana jest podstawowa gra C&C Ancients. Conquest of Paradise Delux 2nd Ed.